Reports are starting to come in…my friend Mindy made fresh masa tortillas the day after I published my post and my eye doctor made them yesterday, using masa from the same market where I buy masa. Both Mindy and Dr. Hom are converted. I promise I’m not exaggerating about how delicious fresh masa tortillas are…if you haven’t read my fresh masa post, here’s a link! Enough tortilla talk, time for this week’s menu…which is a bit shorter for us because we leave Thursday for our east coast trip! A Toyota Highlander will be waiting for us when we land in Boston and this time we’ll hang out for a day in Boston before heading to Cape Cod. I can’t wait to show my kids our college town! Everything on this week’s menu was on last week’s menu…I didn’t cook as much as I thought I would last week, and I really stretched out the carnitas for a few meals. Please share your own menus in the comments below, we need your inspiration since I’m entering travel mode! finally back to a “normal” summer week! I hope you have an awesome trip! 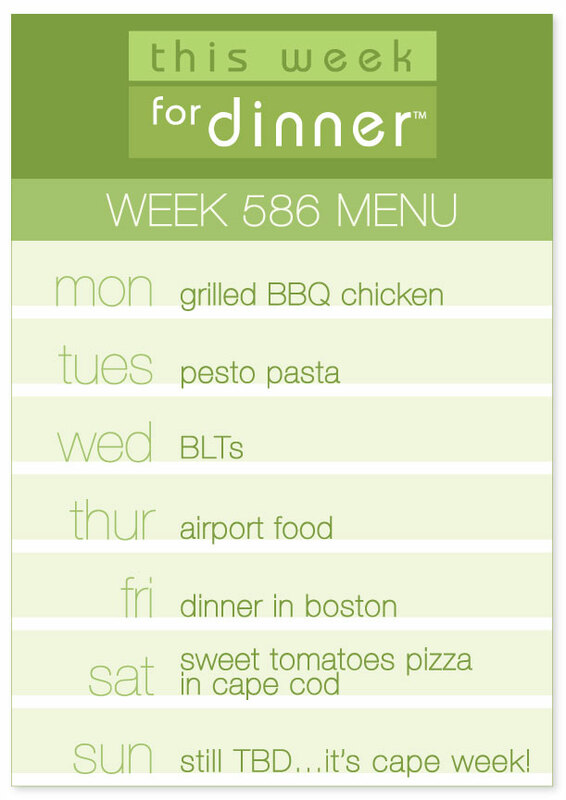 Here are my meals this week, but the days are still to be determined. Thanks for the shout-out and have a good trip! Have fun! I love New England so dang much!